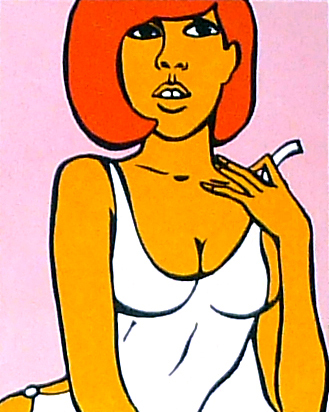 Guy Peellaert's The Adventures of Jodelle (1966) is widely regarded as the first graphic novel to emerge from the Pop-Art movement. This image was used on the cover of the book's German edition. The long-awaited, long-delayed remastered edition of The Adventures of Jodelle, initially scheduled for a mid-2012 release and previously featured on the cover of Fantagraphics' spring-summer catalogue, will finally go on sale on February 3rd. In the meantime, you can start pre-ordering your copy from Amazon. The reason it all took so long? The oversize volume not only offers the painstakingly remastered, retranslated American edition of the 1966 pop art classic and a new essay by the great Pierre Sterckx, it also includes the complete book-within-the-book Guy Peellaert: Fragments of the Pop Years, which spotlights a fascinating, seminal phase in the artist's career. Culled from the Estate's archive, these Fragments provide the first extensive overview of the artist's work throughout the 1960s, from his early years as an advertising dropout in Belgium to the groundbreaking release of Jodelle and the subsequent move to Paris, where Peellaert took the European Pop avant-garde by storm with his indelible heroine Pravda in 1967. While Jodelle and Pravda are familiar tentpoles of the artist's so-called Pop Years, a whirlwind of previously unpublished experimentations encompassing theatre, film, television, comics and fashion is explored here for the first time, including collaborations with such era-defining characters as Serge Gainsbourg, Yves Saint Laurent, César, William Klein, or Jean-Christophe Averty. Available exclusively as part of this first reissue of The Adventures of Jodelle in nearly 50 years, Fragments of the Pop Years marks the Estate's first major publication since Peellaert's passing in 2008, and we hope it will help shed new light on the influence of the artist's pre-Rock Dreams accomplishments. The Roman Empire meets Las Vegas in the striking compositions of Jodelle, where various recognizable personalities make anecdotal cameo appearances (here, Pope Paul VI and President Lyndon B. Johnson driving together in the bottom left corner) in an interpretation of modernity as a gridlock pattern of casually iconic signs.